For the next selection on the highlife turntable, I have selected the track Maye Mbobo by the T.O. Jazz Band off the Ride Away release Yeno Waa Waa. I've written about T.O. Jazz before. I like this song as it is a solid example of what made his work in the late 70's so great: pitch perfect vocal harmonization backed by a rock solid rhythm section. Check out the beautiful dialogue the vocalists create as they solo and come together through out the song. Does anyone know what the word Mbobo means? I think it means something like the word sympathy, but I'd be interested to know for sure. About my only compliant is the song isn't long enough. 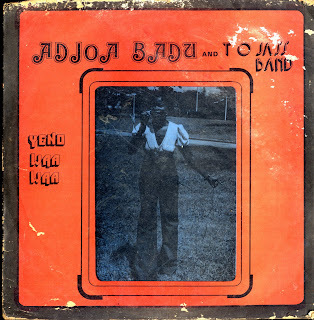 The lead vocalist is a woman named Adjoa Badu. I hope you like it.